New features, updates, and bug fixes on Capitol Call - the grassroots political action mobile app. We've updated our Election Tracker to now allow you to follow Elections - making it easier to keep important election dates front and central - and to also add Elections to your phone's calendar. When you choose to add Elections to your calendar - we'll help remind you to get to the polls. With a reminder 1 week and 1 day before - this will give you time to get informed, make a plan, inform your coworkers and boss, and set aside time to perform your civic duty. We've worked with NewsAPI.org to add more even more news sources - adding the National Review, the Washington Times, and the American Conservative. We now offer 26 different credible news sources across the political spectrum. We've added an Election tracker to tell you what elections are coming up that you can vote in - including Primaries! Powered by Voter Information Project (and others). Added state-specific and local voter information providing details on how to be ready for Election Season. And now easily share online voter registration and verification tools with your social networks - helping your friends and family get to the polls. Based on your political preference, you can now filter the type of groups from which you see Call to Action campaigns. Organizations on Capitol Call are now tagged with their political affiliation / policy alignment - Left, Right, Center/Non-Partisan, and Non-Political - and you can now indicate during app setup whether you'd like to see campaigns from them by selecting which ideologies you'd like in your feed. Launched as Long Distance Voter launched in April 2008 (and relaunched as Vote.org in April 2016), Vote.org has helped 260,000 new voters register, processed 800,000 absentee ballot requests and helped 600,000 people check their registration status. The 2018 Midterm Elections are on the way and we've provided a countdown timer that will help you stay aware of when its time to get to informed about candidates and ballot questions and get to the polls. Additionally, you can subscribe to our Elections Calendar and get appointments added directly to your phone's calendar! 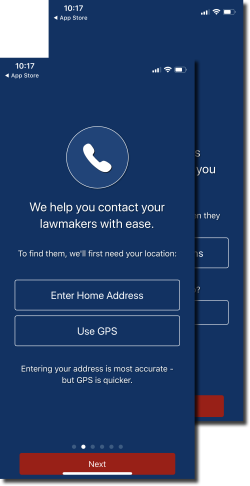 You can select how we find your reps - by address or GPS, which campaigns you'd like to see, enable push notifications, and even follow the organization that may have invited you to Capitol Call. We know we were a bit late to the party on this one - but we've finally added iPhoneX support for those of you sporting Apple's latest and greatest. Capitol Call now pulls in news from up to 23 different media sources from NewsAPI.org. Articles can be Shared to social media or Saved to Collections - a grouping of articles focused on a single topic. Collections are intended to allow the user to put together a cohesive argument for use in discussions - both real and virtual. Future releases will allow Collection sharing. If an article motivates the user to action, a Call Rep option is availabe for all articles - with the app generating a rudimentary call script based on the article to streamline their call. For most news sources, we have included the AllSides.com Media Bias Rating to help users better understand the bias behind their news sources. Using an algorithm to look across the user's news feed as a whole, we apply the AllSides rating to determine and overall Balance Rating of the user's feed. The intention is to help users escape their filter bubbles by getting news from a variety of sources - both left and right leaning - but maintaining a balanced view. Click to learn more about the AllSides Media Bias Ratings. We've added support for state and local campaigns in the Take Action tab. Many groups operate in their communities and we wanted to ensure we supported advocacy at all levels of government. By default, users campaign feed will show national campaigns, state campaigns based on their current state, and local campaign based on their GPS. They have the option to select the top filter dropdown to only see campaigns at specific levels or all campaigns - even those not geographically relevant to them. Additionally we updated the Representatives user interface to make switching between federal, state, and local representatives more obvious and intuitive. Powered by Propublica.com, we now offer more details about a user's federal legislators - helping them understand what their Congressperson or Senator does all day - making it easier to hold them accountable at the ballot box. Now available is their lawmaker's next election date, the frequency of voting along party line, their committee memberships, along with the details and text of all the bills they have sponsored this session of Congress. Added new "What to Expect When Calling" explainer popup giving advice on calling your reps. Following organizations is now easier with improved placement of follow options. Campaign actions were moved higher on the Campaign detail page to make Campaigns more action-oriented. Representative pictures are now clickable to make it easier to access their full profiles. Bug fix for spinner showing for a long time on startup with limited connectivity. Added "Call to Action" explainer better describing the community nature of the Take Action section and more ways to refer or register advocacy Groups. Added more visibility to campaigns by followed Organizations with the addition of a Followed tab on the Take Action section. Campaigns now show their action deadline date (if configured).